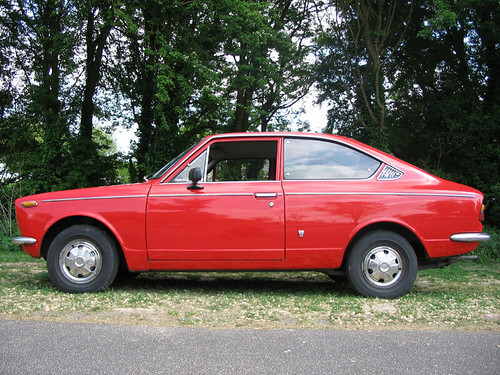 A hundred years ago when I got my first mortgage I sold my 127 Sport and bought a push bike and a beat - up Corolla coupe. 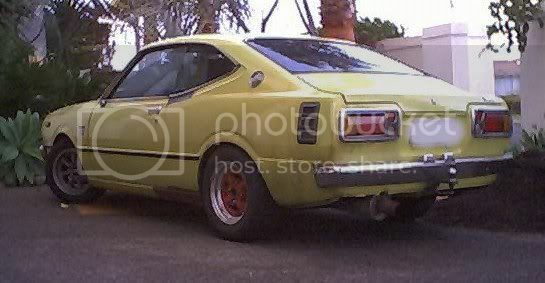 (JAT 64 N) It had been painted in two tone green and yelow with a matt black Starsky and Hutch stripe. I had to replace the driver's seat with something from a limo, which meant I sat too high. The bonnet skin came detached at 70 mph on the M1, which was not good for the aforesaid seat. I fixed it with a couple of cupboard handles screwed to the bonnet and elasticated ties onto the bumper. I once had four punctures in a week whilst on holiday with my then (v understanding ) girlfriend. Ah, happy days. Somewhere there is a picture of it , but I don't know where. I've never seen one before or since. Anyone here got any pics? This one appeared in SLs Portugese thread a while back Pompers - is this the jobby (KE25??)? That looks the one! Though mine was horrible with the bottom half of the body in grass green, the rest in yellow and the black S&K flash. The rear lights were different to that red one's, and the front looked very 120Y- ish. Damn, nice one. Get it back! 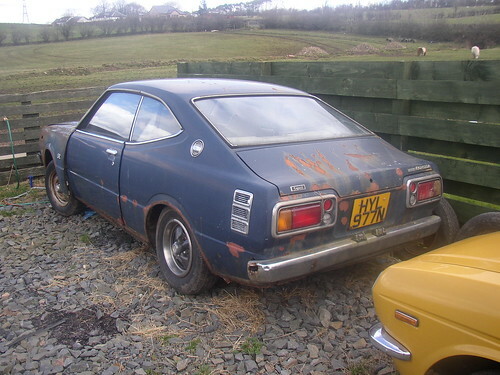 Doesn't help that the 30 series ran alongside the 20 series Corollas for a while - Billy Bonkers! Look what I found in Chiang Mai yesterday! Looks pretty solid, and excellent wheels! So all three that I've seen are in really good shape.